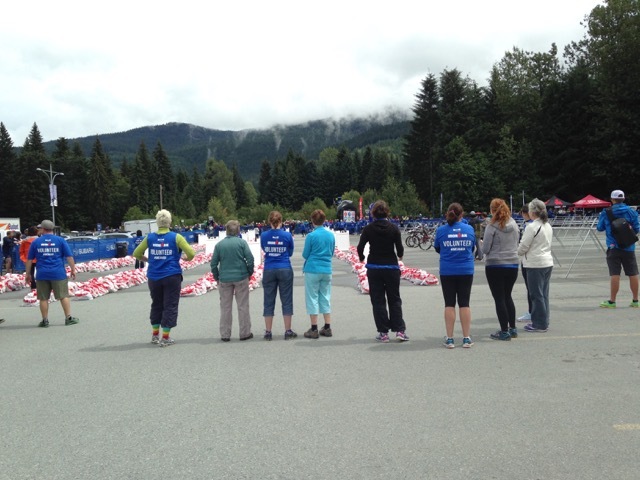 On July 26, I had the chance to spend the day at the Whistler Ironman Canada race. This was my third year taking part in the Whistler Ironman Canada day on some level and it didn’t disappoint. Year one I had the privilege of supporting and cheering on (along side her hilarious and adorable mother Deb), my good friend Kristyn Tobey in her first IM as a pro triathlete. Our family had the opportunity to host/house our friends for the week or so prior to race day. Albeit a brief snapshot, hosting pro athletes is a great way to gain insight into what it takes to become an Ironman. Prepare to be inspired. My boys in particular loved checking out Kristyn’s bike, asking her a gazillion questions about her gear and the race itself, and spent plenty of time playing with and making memories with their new pals. They still speak of these experiences on a regular basis. As for Kristyn, well she raced hard and when all was said and done, found herself in 7th place in her division. Year two I signed my family up to volunteer at the Pemberton BMX hosted aid station. 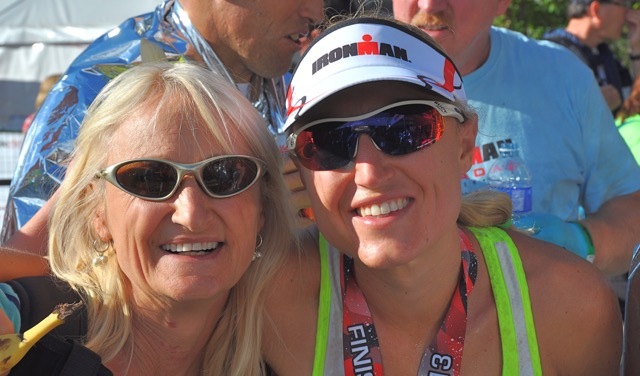 (Community and Non-Profit groups who volunteer to operate aid stations are eligible for Ironman Foundation grants usually around the $1000 mark.) This was marginally against their will, but I did it anyway. As I believe giving is a habit, this was a fun way to teach my children valuable lessons without them really knowing it. It was also a great way to further create bonds with teammates and their families. The BMX kids did a bang up job of chalk art encouraging, providing hydration and snacks to countless thankful athletes, and shared their spirited cheering like only kids can. 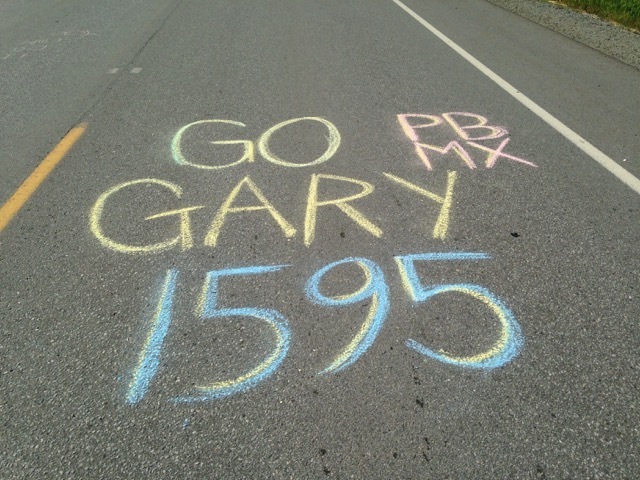 One of the highlights of that particular day for many of us, was cheering on Pemberton BMX volunteer extraordinaire Gary Martin as he raced his way up and down the meadows road. Gary gave it his all and secured 29th spot in his age group. Year three I found myself in a captain position at T2 (the women’s transition area from bike to run). I arrived early for my shift and introduced myself to two fellow volunteers who were triathletes from Seattle. Upon meeting me they inquired how long it took me to attain my Ironman captain status. I’m not sure if it was simply because they were curious or if in fact I looked like a deer in the headlights, but when I responded with “about a day and I’ve never even been in a transition tent of any sort” we had a good laugh. I took a moment to be thankful for these two like minded peeps/instant friends who happened to be rockstars at the inner workings of a transition tent. From then on it was go time. DNF athletes started to come in earlier than expected due to rather intense weather conditions. With crushed dreams and frozen bodies, we tended to these racer’s needs which was everything from providing emotional support, words of encouragement, connecting them with their support crews/family members, to rewarming their bodies and getting them the medical attention they needed. I’m not going to lie, it was heartbreaking to watch racers go through this. 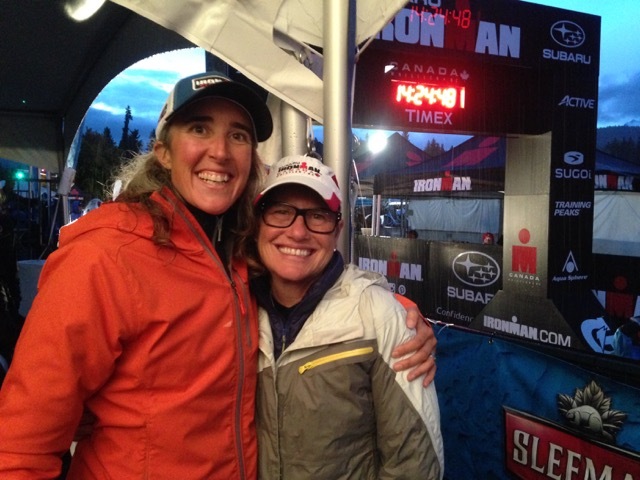 After taking the time to reconnect with one of the racers days after all was said and done, I was pleased to learn that while extremely disappointed she was prepared to get back on the Ironman horse and give it another go and she was so touched that I had taken the time to check in on her. After the initial flurry the arrival of the pro women started. The hard working T2 volunteers got them out the door as swiftly as possible and on their way. I’m pretty sure I look more exhausted after a half hour walk than these uber athletes did after a 2.4 mile swim and 112 mile bike ride in what turned out to be one of about three days of rain in as many months. Very inspiring. The paced picked up for the next few hours with the bulk of the athletes coming in. It was such a great vibe and cool to see and cheer on friends and racers of all ages racing their hearts out. The athletes were beyond grateful for the help of the volunteers along with a chance to sit down on a piece of furniture larger than a bike seat. Bonds were made, high fives were given and away the racers went. As our day winded down, so did the flow of athletes. Left were those, who just making the cutoff, came into our tent looking as haggard as they felt. Our crew gave everything they had to give to these athletes, who as they exited the tent still had a 26 mile run to tackle. I left the tent that evening with a runner’s high that I hope would carry over to all the athletes I connected with in the course of my day especially those last few, and yet another unreal Ironman experience. So after getting up pre dawn, having skateboarded to Rainbow park and back to watch the start, a quick wardrobe change, a 7 hour session in T2, a quick bite to eat, another wardrobe change, and a tea to warm up, I find my self at the finish line for some more cheering. Somewhere around 11pm as I’m hanging with my pal Maridee at the finish and in between racers finishing, the dull roar of the announcer saying “you are an Ironman” for about the 1550th time that day, clapping and cowbell ringing she says to me “Want to see the coolest thing?” Of course I’m in, and she whips out a Starbucks GC that an Ironman athlete had taken the time out of her day to gift upon her as Maridee assisted her through T1. 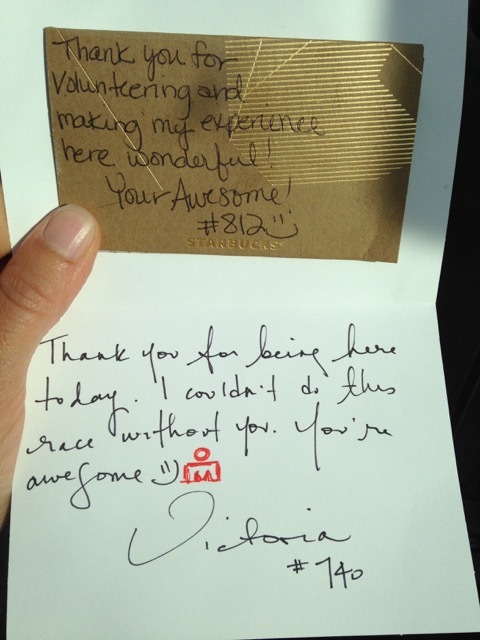 It looked like the card shown on the top of this photo: “Thank you for volunteering and making my experience here wonderful! You’re awesome! #812 😊” I was so stoked for Maridee and said to her “you know what makes that even cooler?” I bust out my phone and show her this pic I took earlier in the day of a similar hand written note and GC #812 had generously shared at T2 where I was helping out. We had a good laugh and I promised Maridee I’d share this story on social media sending out huge gratitude on her behalf. If that’s not a bit of Ironman magic I don’t know what is. Thank you #812 for making our day. Also a huge shout out to Victoria #740 who also bestowed treasures upon me while in T2. I can’t thank you enough for taking time out of your big day to think of others. Not only are you an Ironman, but you’re both top notch humans and I applaud you for your efforts on all accounts. I look forward to seeing what year four will bring…. Photo of the Week from guest contributor Paul Cumin. Who else wants to play?